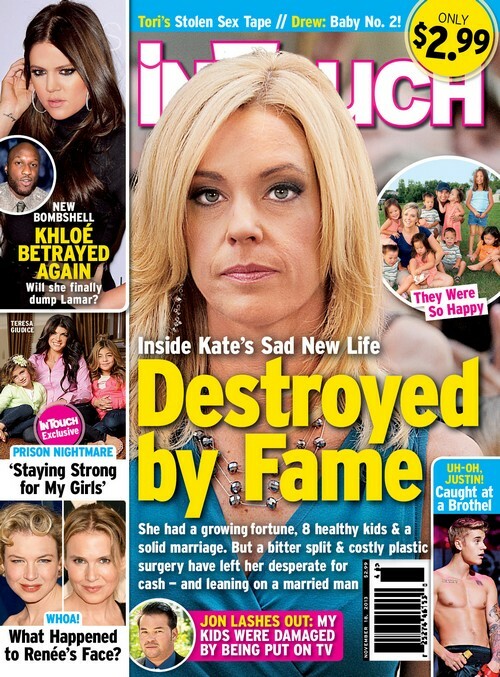 According to the new cover issue of In Touch Weekly, Kate Gosselin has a very ‘sad new life’. Boo hoo, she brought it on herself. The cover deals with how Kate went from being successful, having a growing fortune, eight healthy kids, and a solid marriage to being broke and desperate for money. According to the report [which we already knew], Kate’s financial woes can be traced to her pricey divorce and custody battle with Jon Gosselin, and her costly plastic surgery. Because she’s reportedly so desperate for cash, she’s started to ‘lean on’ another married man. We already know that Jon Gosselin has been doing everything he can to fix his public image, going on Oprah and bashing Kate for ruining his children’s lives. He’s trying to come off as the better parent, despite the fact that he just shot a gun at a random paparazzo outside of his property the other day. Regardless of his efforts, I think people would choose Kate if they had to pick the saner member of the Gosselin parents. But even then, those poor kids have a hell of a few years in front of them. There’s a brief story on Justin Bieber‘s visit to the brothels in Brazil, which has gone viral. The report makes it sound as though Justin’s in trouble for being caught in a brothel, but this is actually the least obnoxious thing he’s been doing while in Brazil. There’s also a feature on Renee Zellweger‘s drastic facial transformation, since it’s obvious she’s gotten more plastic surgery. Finally, there’s the never-ending saga of Khloe Kardashian and Lamar Odom, which doesn’t look like it’s coming to a close any time soon. What do you guys think about Kate Gosselin’s financial issues and all the rest of the stories? Let us know your thoughts in the comments.